Our journey along the Tyrrhenian shores of Calabria begins in the famous bathing resort of Tropea and draws to a close in Scilla. This part of the Italian coastline is famous not only for its historical importance and natural beauty but also for its proximity to the mountains of Aspromonte: indeed a short detour is all it takes to find oneself surrounded by mountain scenery, breathing the clean air of Southern Italy's highest mountain range. A favorite holiday destination on the Costa degli Dei, Tropea is renowned for its beaches and little coves lapped by a crystal clear sea, but also for its delicious red onions. The town stands on the promontory between the bays of Gioia and Sant'Eufemia: this magical position gives Tropea an incredibly varied landscape. 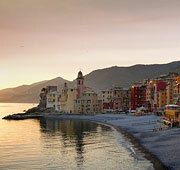 Among the town's beaches, Linguata (named after its tongue like shape), Cava, Bacino, and Cantini, are the most popular. 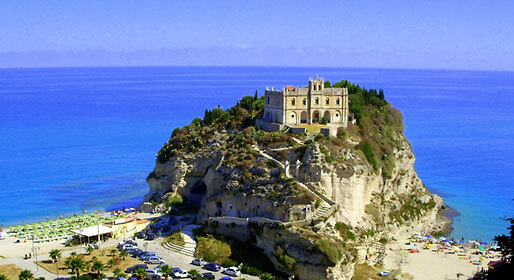 Tropea's historic center has a number of noteworthy patrician town houses and impressive monumental edifices such as Palazzo Toraldo, once a castle and now home to Tropea's Archeological Museum, and the 12th century cathedral, built during the Norman dominion. 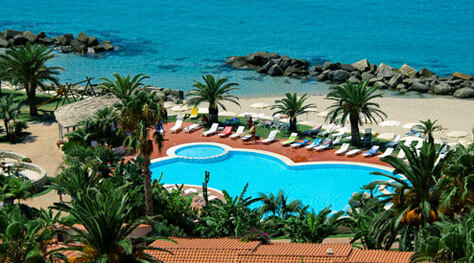 The town has a total of six magnificent panoramic terraces, each of which overlooks the sea. Continuing along Calabria's Tyrrhenian coast, we soon arrive at the town of Capo Vaticano, situated in the commune of Ricadi and built on the high plateau of Monte Poro. A succession of white sandy beaches greets the visitor. Few will resist the temptation to take a dip in the warm waters of Capo Vaticano. Other famous beaches include the Occhiali beach, the Baia di Riaci, and the Volo di Corvaru: this latter lying beneath a sheer cliff where boisterous flocks of crows come to nest. 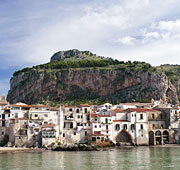 Then there is the Baia di Formicoli: a diver's paradise, famous for its fauna-rich seabed. Leaving the Costa degli Dei behind us, we continue southwards to the Costa Viola, the Violet Coast, where the color of the sea at sunset really does turn purple. Here we find Scilla and, on the Sicilian coast directly opposite, Cariddi. Legend has it that these two towns were once inhabited by monsters, ready to devour incautious navigators as they passed through the strait. The town of Scilla is comprised of two centers: Marina Grande with its long beach and modern aspect, and Rione Chianalea, a characteristic fishing village complete with pretty little cottages built right on the water's edge. 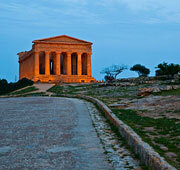 We need travel only a few kilometers to reach Gambarie and to find ourselves surrounded by Calabria's mountains. Gambarie is, in fact, one of the most important ski stations bordering the National Park of Aspromonte. During winter, visitors come here to ski. In the summer months the area is perfect for trekking and high altitude rambles. To see the sea, this time from on high, we take the chairlift to Monte Scirocco and Monte Nardello, from the summits of which there are breathtaking views over the green woodland, the blue sea of the Coast Viola and as far as the coast of Sicily.